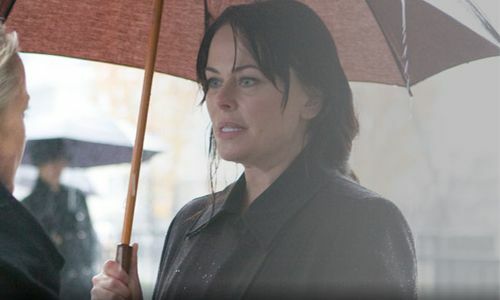 Cultural Wormhole: Caprica - "Retribution"
Sister Clarice (Polly Walker) on a particularly rainy day in Caprica City. The creators of 'Caprica' have openly admitted that they had to change gears on their original characterization of Sister Clarice. The original concept was to have her played more humorously, along the lines of Gaius Baltar on 'Battlestar Galactica'. However, due to Clarice's dark associations and the calibar of actor that Polly Walker, this had to change and quickly. The second half of season one has seen a dramatic change towards proactiveness from the character. Last week saw Clarice's power play that resulted in the murder of a high cleric and the backing of the monotheistic Reverend Mother. This week Clarice murders two of her students that were involved in the aborted bombing attempt of the spaceport she was to return through when she came back from Gemenon (isn't ironic that the seat of monotheism is on a planet whose name is associated with Gemeni - the twins?). This leads to her ultimate elimination of the biggest threat to her STO authority on Caprica, Barnabas. Now, despite being handcuffed next the the bomb, there was good deal of time between Clarice leaving in the elevator, reaching the ground level, and then detonation. In other words, that's plenty of time for the man to escape. Lacey has really gotten in over her head. She screws up the spaceport plot and has to constantly prove her loyalty to Barnabas. Thankfully, it never crossed over into more mature demonstrations of trust. However, unlike poor Keon, she's fully aware that she can't just walk away. Lucky for her, Clarice has some idea that Lacey is important to Zoe and could be important in her plans for Apotheosis, so she avoids her own elimination. Clarice may have to deal with being a target for retribution herself, if Agent Duram is able to convince Amanda Graystone that the school headmistress is STO and responsible for the conversion of Zoe. Fortunately for Clarice, she's as good an actor as Polly Walker, so Amanda ends the episode uncertain whether or not Duram was correct in his accusations. Daniel keeps heading down darker paths in his bid to reclaim control of his company from Vergis. He's using the Tauron mob to blackmail the various Graystone Industries board members so they will vote to reinstate him as the head of the company. There seems to be a large number of skeletons in closets to exploit and the board seems riddled with a lot of amoral individuals. Still, Daniel is pushing so hard, that one man commits suicide, but not before leaving letter to his soon-to-be widow. She clutches it when she confronts Daniel, so the implications of the letter may not have played out entirely. The entire episode is shot under rainy skies. While artistically this is an interesting choice, but the ever presence of torrential rain seemed a bit forced. Given the 'Caprica' (and for that matter 'Battlestar Galactica') creative staff's love of melodrama that borders almost on self-importance, this sort of technique comes across a bit heavy-handed. I'm sure the crew and cast didn't really enjoy themselves working while constantly soaked. Still, these first two, post-hiatus episodes have been fairly focused, primarily on Clarice and Daniel. Both are fighting bloody battles to gain or regain power, which thankfully hasn't left much room for V-World or New Cap City. Unfortunately, if the previews for next week are any indication, this is about to change.